The RadChat component is exposed as of R2 2018. 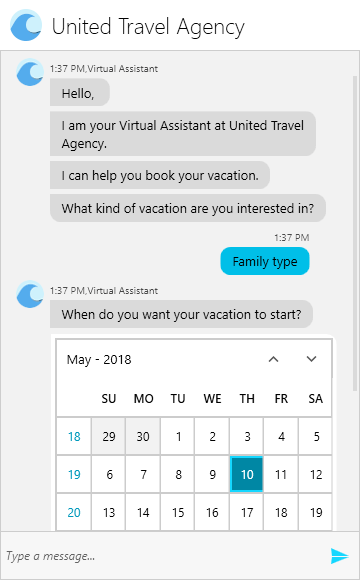 It enables easy implementation of conversational UI in WPF applications, whether by utilizing certain chatbot framework, by following a predefined logical tree, or just for integrating P2P chat capabilites. Messages: A predefined set of built-in messages depending on the type of data that needs to be sent. Cards: Displaying a message in a structured and intuitive for the user manner. Overlays: Calendar, List, Carousel, etc. Suggested Actions: Make the user's input easier by adding suggestions. Type Indicator: Indicate to the current user that another Author is typing. ToolBar Commands: Enabling user interaction with the ToolBar through triggering ToolBarCommands.